Rukha sukha hai ye sansar, jab tak mile na Govind ka pyar. Jeevan ki dhara Radha ban jaae, Kanha se mil kar ek ho jaae. Kahan gaae mere Swami, tab to thi mein tadap se pyasi. Mujhe mil gaae antaryami, ab to magan hui ye dasi. “Karo mann Nanda Nandana ko dhyaan”. “Oh mind fill yourself with the name of the Lord." This whole world is of no support to me, I come to rest in Thy arms. Oh mind fill yourself with His name. I roam thirty and tired here and there, I have come to rest in Thy arms. May my mind always be filled with Him. May my heart be captured by His presence. I dance in a trance filled with ecstasy as if the whole world doesn’t exist. Leave me alone filled with His name. This soul, this bliss, this oneness is all there is. “Karo mann Nanda Nandana ko dhyaan. 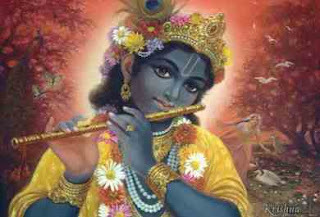 I have thrown away that veil of separation oh Govind. Come to see me again, I will not refuse to see your face this time. You are my only companion. I remember Your most charming, enigmatic face, which I saw and lost my senses. I witnessed the charm, the attraction, and the warmest most handsome face in the entire universe. Eye to eye we saw each other unmoved despite the pouring rain and thunder. 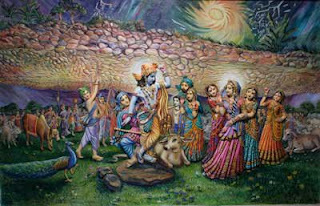 Unmoved you were holding the mountain, O Giridhari. 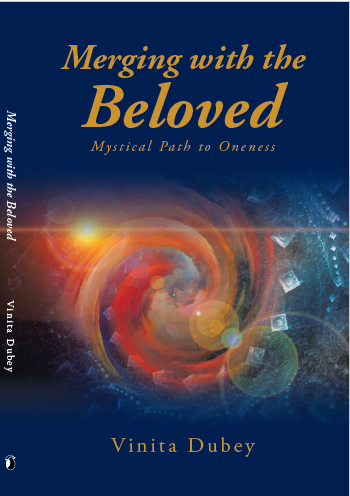 Unmoved I was surrendered to you, merged into your eyes eternally, untouched by everything, unaware of the world. That day I realized what I had missed all my life. Had I seen you the first time when you asked to see my face, I would not have lost all these years in this delusion. This moment alone is real in your presence. O Giridhari! you are the only support of Govardhan, we only imagine ourselves also supporting with our little sticks. O Govind! you alone are uplifting my existence, you are my only support. Narayanam Adi Purusham I sing to You alone. Govindam Narayanam I just want to come home. Matter and mind nothing I find as real but for You. With you in my heart I open my eyes there's You...You You You! GOVINDAM ADI PURUSHAM TAM AHAM NAMAMI!